Last month, our editor-in-chief Chelsea had the honor of visiting Dubai and getting to know some of the local wedding community through the Arabian Academy of Wedding Planning as a guest speaker for their Wedding Biz Talk series at Arabian Ranches Golf Club. When we learned that beach weddings are hugely popular in Dubai because of its obvious coastal geography, we got excited and asked our friend, Bonita Carr, the Academy Career Advisor for this UAE campus, to share some of her local beach wedding trends with our Virginia couples. Inspiration surrounds us, and what better place to inspire than halfway across the world! So we will let her take it from here! With so many predictions floating around about the upcoming colour for 2018 from Pantone, we're waiting with bated breath as this always can influence wedding trends. 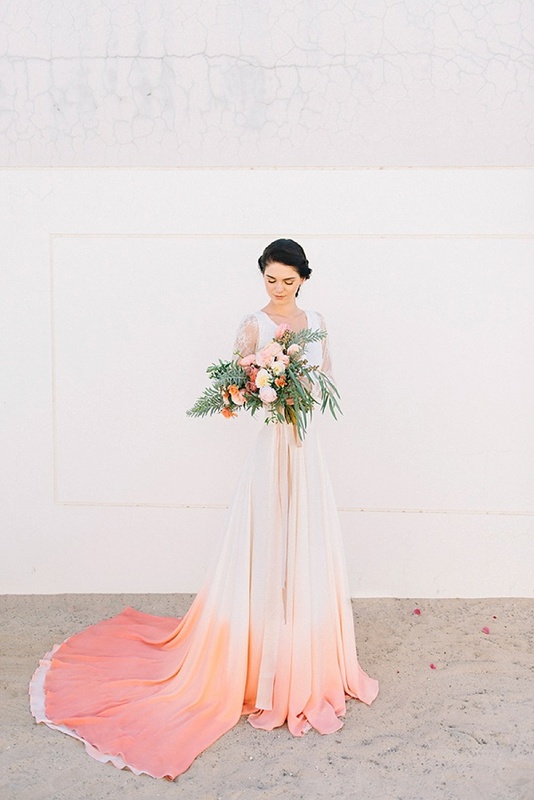 Here in the Gulf, our weddings follow trends, generally speaking, a season later, so we're well-poised to take advantage of the earlier palettes released by Pantone and made popular by other wedding communities. I say this simply because we are very firmly stubborn when it comes to colour from both a cultural and religious consideration when it comes to weddings. We love it here! Purples, reds, blues, and shades thereof are royal United Arab Emirates (UAE) colours and associated with luxury, and so these colour themes are some that are timeless locally. In the Middle East, we're no stranger to the use of metallics either. How better to create a luxury feel to an event with the use of gold complemented by a bright bold colour, particularly on the beach? Hot pops of bold colour will be big in 2018. Think of a gorgeous purple colour palette paired with gold. Super luxe and yet easily translated into a beachside setting without being overpowering. Bold colours will dominate especially when added to other popular wedding trends such as metallics. 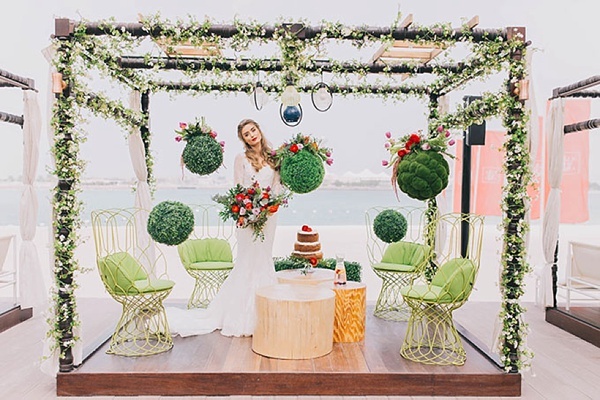 In the UAE, we have to contend with heat and direct sunlight for 80% of the year, so vibrant tropical flowers are a natural choice for a beach wedding in Dubai. When Pantone announced Greenery as the 2017 Colour of the Year, greenery (as in florals and plants) was already becoming well-loved with couples and will only continue in popularity. Many of the resorts in the UAE offer a lush, almost tropical beachside setting with beautiful gardens. The use of native greenery such as palm fronds are going to see a resurgence to take advantage of the trend, but not just as a plain green. By combining a complementary bold colour together with Greenery, we will see this color being used in new and innovative ways. In the Gulf, we have never been shy about the use of wood in a wedding setting, especially for tables and furniture, and marble is going to be a great paired natural element with it. They need not be heavy and overpowering, but it both complements the serene surroundings offered by the backdrop of the azure Arabian Gulf. We will see this trend transmute to be a touch of luxury and be used as an accent colour in itself. Think dark wood navy chairs on a beach with a dark wood arch to offset the turquoise of the sea with luxe flowers in bold colours. Or serene colour palettes combined with marble dance floors and marble cake décor to offset an amethyst and gold palette. The Gulf is already known for over-the-top lavish weddings featuring heavy embroidery on gowns, and the use of pearls inspires beyond the fabric. The fact that pearls are such a huge part of the cultural heritage of our region means endless possibilities when it comes to wedding details. Think small for a maximum effect like mother of pearl-accented flatware and napkin rings. 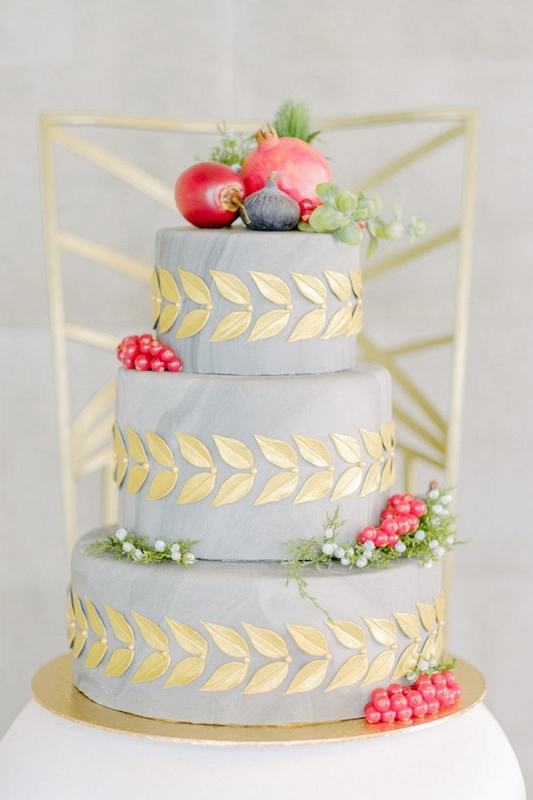 In general my opinion is that we will see even more personalization when it comes to beach themed weddings, gone are the days of soft colours and blues, we’re definitely in the business of luxury out of this world celebrations in the Gulf and the current colour predictions for 2018 will definitely be embraced with open arms. Love Dubai and wish to visit the Middle East, too? Be sure to check out our Arabian Summer Days feature on Tidewater and Tulle Travels for some fun, inspiring vacay ideas and videos. It has camels!